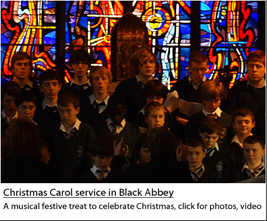 The community of CBS Kilkenny celebrated the season of Christmas with a moving festive musical treat in Black Abbey on Friday December 14th at 2pm. All members of the school music department entertained the congregation with their musical talents. Opened by the pipeband, this was closely followed by performances from the jazz band and a rousing number of solo and choral performances. Ms Dowling and the two Ms Mahers did an excellent job preparing the boys for the recital and Chaplain Fr Jim Murphy officiated. Principal Tom Clarke thanked all of the school community for their diligence, generosity and kindness of spirit during the past year, and he wished everyone a very happy and peaceful Christmas.